We are trying to have fish for dinner once or twice a week. Fish seems to be more friendly to our digestive systems as we are getting older. When I have any leftover (fresh) fish, I will freeze it to save for later. 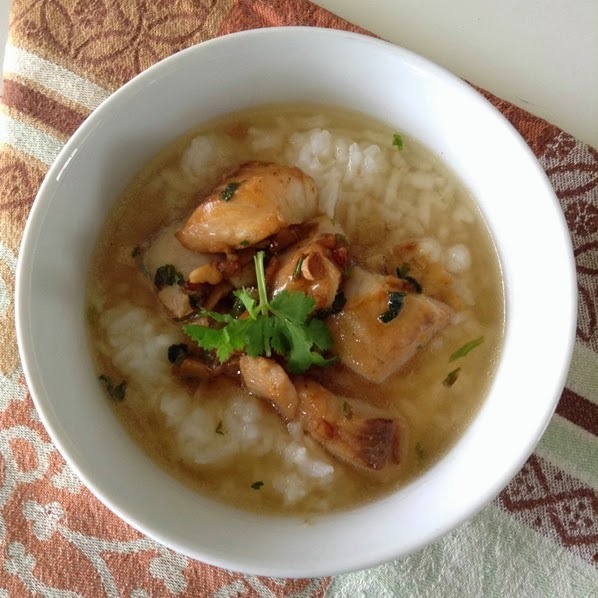 This rice soup with fish is one of the dishes that I use such frozen fish because I do not need much - just leave the fish to defrost in the fridge overnight and of course you can also use fresh fish! Simmer chicken stock in a suacepan and warm up the rice in either microwave or steamer. Finely chop garlic, coriander (root and green bits) and ginger together. Fry the mixture in a little bit of oil in a wok or frying pan until soft and fragrance. Add fish, pepper and soy sauce - fry further until the fish is done - add chicken stock. Let it bubble briefly then remove from heat. Divide hot rice into two bowl and ladle fish soup over the rice. Garnish with coriander leaves. Serve hot. Add salt or more soy sauce if needed.